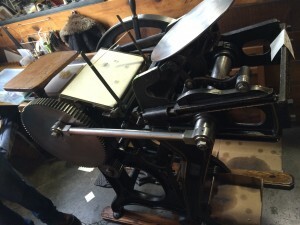 Letterpress is the oldest form of printing with origins dating back to the 15th century in Europe and as far back as 1040 AD in China. This type of printing is a very intensive process that requires a lot of time, skill and patience. Basically, ink is applied to the surface of a metal type, with raised face and reverse image, like a rubber stamp. The type is then pressed against paper to make an impression. So, isn’t this old school? What’s this going to do for your modern business and brand? Great question. The benefit of letterpress today is that it’s not widely used and it differentiates your message and brand in your client’s mind. 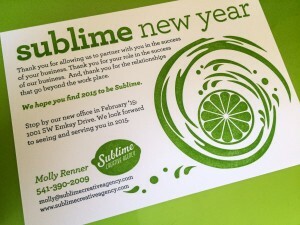 Sublime’s 2015 New Year’s card to clients and colleagues was printed on letterpress. It was a unique way to thank my clients for their business and wish them success in 2015. I’ve attached an image for you to see how beautiful it turned out and I’m thankful for my partnership with Sam at Teenee Mi Design and Letterpress in Bend, Oregon. She has her own machine (as seen in the blog images) and it’s one of a few in the local area. In this fast-paced technology world filled with electronic greetings, letterpress brings us back to a handcrafted art form. Now go and create your work of art and make an “impression” for your brand. And in the meantime, have a Sublime 2015.